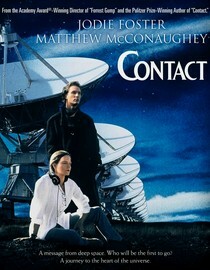 For the sixth time, I watched the 1997 hit movie, "Contact," starring Jodie Foster, Matthew McConaughey, Tom Skerritt, John Hurt and James Woods. Once again, I totally enjoyed the story, which is based on the novel by the the late Carl Sagan, astronomer and TV personality. Jodie Foster is a passionate SETI (Search for Extraterrestrial Intelligence) scientist who perseveres until she picks up complex messages coming from the star Vega. This works in the story because Vega is one of the nearest stars, only 27 light years away. So the first TV signals to project into outer space theoretically could have arrived at Vega and been sent back during a 54-year time span. Embedded in the signal are engineering plans for a huge, complex device to transport a human from Earth to Vega via a wormhole system. This works in the story because it's the only conceivable way a human could make the trip and back in a reasonable amount of time. For example, the fastest spacecraft ever built traveled at 50,000 mph. That's pretty fast, but what if it could go 100,000 mph? No, make it a million miles per hour! Even at that speed, a craft would take about 2,000 years to reach Vega. So the idea of a wormhole made the story more exciting. But not more realistic. It's true that practically everyone who enjoys science fiction has heard the term "wormhole" and seen graphic images of them. But as far as science is concerned, they don't exist. Mathematicians say they are possible only in theory, and in reality no astronomer has ever detected anything like a wormhole. And if wormholes proved to be real, they wouldn't work for transportation. The math says that a theoretical wormhole would be unpredictable and unstable. So you wouldn't be able to journey to it and show up at the entrance. But even if you could, the wormhole is likely to vanish before you make it to the other side. You'd be toast. And even if you got lucky and made it through, you couldn't predict the location of the exit point. Or even worse, you'd never be able to return to your point of origin. You'd be stranded light years away without knowing where you are any having any hope of returning. In other words, as far as space travel is concerned, wormholes are the most outlandish kind of fantasy. But it's an engrossing fantasy! "Contact" takes the conflict between science and religious belief head on. It's an inspiring success story and an engaging love story, and it has amazing special effects. But as much as I enjoyed seeing this near-future" sci-fi story one more time, it didn't inspire the same belief and hope that Carl Sagan had in the possibility of intelligent life on other planets. When you actually check the math, you see that it's just too far to go. I love the movie "Contact", too, and it's probably for the same reason I love Star Trek. It nurtures the human dream of exploration and discovery of new people and new worlds. Does the impossibility of faster-than-light speed, or of transportation-friendly worm holes, hinder my enjoyment of Contact or Star Trek? Not in the least. One of my favorite quotes from Shakespeare is from Hamlet: "There are more things in heaven and earth, Horatio, Than are dreamt of in your philosophy." This reminds me that we all have a very limited understanding of the world. It also tells me to keep an open mind when it comes to inconceivable things such as God, the future, and death. Thanks for your post and for letting me share. The same idea explained in Quran when Prophet Muhammad(pbuh)visited Heaven and met God in friction of seconds, when came back even the door lock was moving.